When I was a kid, growing up on a farm in the Adirondacks of upstate New York, I do remember declaring the universal, “I’m bored” with a dramatic sigh to my parents. But not that often. And my boredom certainly wasn’t taken all that seriously. What we did was “playing,” in the most old-fashioned, ordinary, unsupervised, Little House on the Prairie sense of the term. And here’s what I learned from my hundreds of hours running in the woods, building snow forts, stomping in puddles, building mud kingdoms, and riding my bike down hills. It’s just as fun to swim in muddy swamps as clear lakes. Leeches are hard to get off. It’s best to sled down steep hills that don’t have trees in the middle of them. Baby livestock animals — pigs, cows, chickens, sheep — make perfect pets to train and play with, until they grow up, are slaughtered, and then you eat them. You can enter Narnia any time you like through a tire swing at the edge of the woods. Wear pants when you’re climbing up huge rocks. It’s more fun to create sandcastles in dirt during mud season than using the finest sand from the most pristine beach. If you’re given a second-hand bicycle with foot brakes, check to see that they work before heading off down the steepest mountain within miles. Wiffle ball tournaments are a required part of every summer evening, and usually last until bedtime. It’s perfectly acceptable to climb up a tree halfway if you’re too scared to go all the way up. These are some of the best lessons of my childhood, and I remembered them today when I read about a British research study reported by the BBC that concluded that children should be allowed to experience boredom. Furthermore, constant and adult-supervised activity can stifle creativity. And we needed a research study to tell us that? I’ve spent a good portion of my adult life reading, analyzing, doing, and evaluating research. But surely this is one facet of childhood that should be so obvious that it doesn’t even need to be scientifically validated for our society to know that it’s true. Dr. Teresa Belton, the study’s lead author, questioned artists, writers, scientists, and other creative types as adults about their childhoods. She found that these thinkers related their early experiences of solitude, free time, and reflection to their creative capacities as adults. Intellectually and developmentally, it was these adults’ hours of time spent drawing, thinking, observing, and pretending on their own that cultivated their imaginations and motivation. I wonder about this every time I hand my son an iPhone in desperation for a few moments of peace. He’s only a toddler and is way too young to be doing all that much independently. But if I surrender now to his inarticulate demands to be entertained all the time, how will I ever be a strong enough parent when he’s 8 and tells me — again and again — that he’s bored? By that time, we could have even greater numbers of technological toys beyond iPads, DVRs, and laptops to fill the time and mental space of children. It’s easy to be nostalgic for my childhood of the 1970s — and I certainly am — but we as today’s parents face different obstacles in raising independent, creative children than our parents did. We’re told that our kids are unsafe practically anywhere, even on our neighborhood streets. We’re told that our kids need to be academically stimulated at all times. We’re told by marketers that there are endless varieties of products — from toys to games to computer software — that will occupy and stimulate our kids. It’s more than possible that my son will write an entirely different list of 10 things that he learned from his childhood and they will be equally important and valuable. But I worry that he’ll grow up in a world in which , “go outside and play” has no meaning and that much of the joy and freedom of childhood has been culturally lost. What are the most valuable lessons from play during your childhood? How do you cope when your kids are “bored”? Don’t forget to check out the next essay “Sole Sisters” in our HerStories: Tales of Friendship series! She’s one of Stephanie’s friends…. And congratulations to my friend and collaborator Stephanie on her selection to the 2013 “Listen To Your Mother” cast, a national series of original live-readings on Tues., May 7th! Hooray, Stephanie! First of all, I kind of snorted out loud at #4 about the livestock! Second of all, I think about this all the time. One of my stay at home mom friends, of a not quite two year old, called me in tears a few days ago, wondering if she was a bad mom for not entertaining her kid ALL the time. She was feeling guilty for wanting a few minutes to sit down with her phone or computer and let her daughter play alone. “NO.” I answered emphatically, trying to reassure her that kids really need this “down-time” where they are playing by themselves and figuring things out. A wise teacher I know refers to this time as children being “with themselves” rather than “by themselves.” Interesting spin, no? That’s exactly what this researcher was getting at! Kids need to learn the art of solitude: how to explore inside their own heads. But how possible is that when all of the examples around them — even adults — never do that either? I do the IPhone thing only in stores where I need a span of time to try things on. My kids have limited screen time, and since I refuse to entertain them, they’ve done a good job going off and creating their own narratives and play time in the house. But that’s two kids — you may need to “train” your single toddler to do this with blocks or toys or trucks, to create the narrative. My oldest child didn’t start doing it until his younger sister was old enough to reciprocate interactions. I think it definitely helps when your kid isn’t an only child. All of my memories of play time as a kid involve my little brother. That’s a really good point. Thank you for sharing your thoughts. I have been thinking about this for quite some time now – what is the right balance of stimulating the children and allowing them to get bored? I grew up in a small island with lots of freedom and opportunities for play. I am sad that my children will not experience this but I am trying to create an environment for them where they feel free and have lots outdoor play. It is hard work. Greetings from England! Anastasia recently posted…What does it take to be a good parent? Oh, an island! That’s the best type of childhood playground! Where in England did you grow up? My mom’s family — my grandparents, her relatives — are from Sussex. Great post! my kids have a hard time with boredom. When I hear them whine, I remind myself it’s not my job to entertain them! I think I love you. THIS is what I’ve been talking about FOREVER, but nobody seems to want to listen to me. I worry about this all the time- more so when my kids were younger. Now they are 10 & 12 & have (& can’t live w/o) their electronics, but I held off as long as I could. I sometimes feel like it’s a losing battle. I do what I can to keep them away from electronics, but it’s everywhere & I feel like I am the only one trying to limit screen time so how much can I really do? Even my husband doesn’t support me fully in this endeavor. The minute we get into the car the movie goes in (not to go around the corner but to take a 2 hr trip which isn’t even that long). If it were up to me we wouldn’t have TV in the car – like they don’t watch enough of it at home. But there are only so many battles I can fight. We were on our way home from visiting relatives this weekend (2 hr trip) so of course my son’s watching a movie & it struck me that he’s not seeing the city lights from the bridge we were crossing or the sun setting or the shapes of the clouds. It made me sad, but I’m only one person. I can’t do it all. I know! We’re all fighting a really hard battle! I hadn’t even thought of car rides too and how much they have changed. We barely even got radio stations where I lived so our car rides were also times to look out the window and think by yourself. (Well, unless my brother and I were fighting so much that we had to stop the car.) Now even that — a quiet car ride — is hard to imagine. When children complain of boredom, I echo my mother-in-law, who said, “There is no such thing as being bored. There are only boring people.” That usually shuts them up, once they understand it. We’ve given our kids lots of down time. Limited screen time. The boys tend to go outside, sometimes all day long. We lived for 6 years on a boarding school campus, vacant of students in the summer, lots of acreage, and perfectly safe. The girls opt for down-time in their rooms. If they’re bored, I usually hand them a book, or a chore. 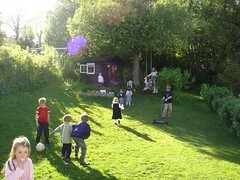 I agree about kids totally needing to be able to use their own imaginations and even go outside to play. I grew up in Queens, NY, but once the weather began to get nice again each year, I spent all my days and extra time outdoors riding my bike, roller skating, doing hopscotch and so much more. I see a lot less of this nowadays and it truly just amazes me. Will be sending my girls outdoors though and letting them create their own memories though, because I can’t help but agree with this being so vital and essential. I’m going on my last couple of days teaching preschool. I see a whole generation of kids who have no idea how to entertain themselves. They must constantly have someone entertaining them, mainly because we don’t sit them in front a screen at school. Sad? Yes. My own kids act like I’m killing them when I make them go outside. Not only that, they want me to still come out and entertain them. We’re parents that frequently tell our kids to go play, go find something to do-we don’t encourage this! It drives me bonkers. My daughter at least has figured out that it is actually fun to go play in her room and pretend-she’s four. My eight year old son has not figured this out yet! Can you tell this is a bit of a sore subject with me! I was a child that spent a lot of time outdoors as a kid as well. HA HA! Great post! Thank you! I don’t think it’s kids’ or parents’ faults. It’s just a cultural thing. I don’t envy preschool teachers. They are so many little kids who haven’t yet been exposed to learning how to play. Such a tough job! It’s so important for kids to learn creativity but an incredibly difficult thing to teach. You just washed away 10 years of mom-guilt with one well-researched blog post. Thank you sooooo much. I mean, I always shrug off the “I’m bored” sigh, but it doesn’t mean I don’t wish we were one of “those” families with a packed social schedule (and domestic employees to accompany the children because, hello, I’m busy doing nothing). This was great. Oh how times have changed and it is a constant reminder all over. I remember when I was a kid, all the time we spent outside using our imagination, running around, having fun, playing with friends. Kids these days seem to have lost that interaction as they all feel the need to play video games, play on their computers. It saddnes me that there have been times when I have had to force my children out of the house! I’ve learned to interpret “I’m bored” as meaning “I don’t feel right and I’m not sure what to do about it.” And it means, usually, that I need to offer a hug and a cuddle–and not become an activities director. And then they go on to explore… run… or perhaps just sit and think. nothingbythebook recently posted…It’s 4:30 a.m.: do you know where your children are? That’s a really terrific way of approaching “I’m bored.” They know that you’re always “with” them — in the sense that you love them and will always be there for anything important — but they know that they have to learn to be creative and occupy their own time sometimes too. don’t stress about the iPhone use as a toddler, sometimes you just need a moment! (everyone’s sanity count here!) when they’re older, it’ll be much easier to insist they deal with it on their own, it’s a different world then. great article. my kids are extremely bored quite often, the horror! I call it relaxation for the brain. I love this post. I grew up on 11 acres where the closest neighbor was half a mile away. Any visits to friends’ houses required a parental taxi. My brother and sister and I spent most of our childhoods inventing games to play (“Who Can Jump from the Highest Tree branch?” and “Retaining Wall Long-Jump” were popular). All three of us grew up to be extremely independent, creative, critical thinkers, and problem-solvers. I don’t doubt that the atmosphere of “if you want fun, you have to make your own” had a ton to do with it. I’m sad for the coddled, entitled generation of people we are creating. I heard “Not now, I’m busy. Go play.” from my mom on a constant basis, and I turned out just fine and I never doubted her love for me for one single second. Thanks for the leeches tip! It sounds like your childhood was much like mine. We had no neighbors and grew up on a similar number of acres. We made up all sorts of games. And I too feel sorry for a lot of kids today, who will never understand the good points about being told by your parents to go away and do something on your own. I couldn’t agree more. Organized sports are great things. Electronics can be loads of fun. None of it is better than a few hours of being locked out of the house to play on a beautiful day. Balance is key, and it seems to be something everyone struggles with. People tell me all the time about how good my kids are at doing things themselves and that their children aren’t. My kids weren’t born to do things on their own. I “taught” them how from an early age. It’s all about choices we as parents make. I do think kids should be allowed to be bored- or in other words, find their own way to entertain themselves instead of constantly being entertained by their parents.